I've been reading and watching a lot of bleak stuff lately. Reading Wuthering Heights, Batman: Death of the Family, like a ton of murder mystery novels--specifically And Then There Were None, Watchmen, Marvelman etc. And watching things like Black Sails, True Detective, Call the Midwife (I love this one but come on, every episode operates in exactly two modes: hope and tragedy) and Game of Thrones. After a while, it starts to get me down. And, without my regular Star Trek booster, I was found myself really needing something to pick me up. Enter the revival of Cosmos. If you're reading this blog but don't know about the original Cosmos, you should really go check it out and then follow that up by reading everything Carl Sagan ever said and did. I get it, though, if you find it hard to get into. This program originally aired on PBS in 1980. And it shows. If you didn't grow up with Sagan, it's probably hard to get past the haircut and the corduroy jacket. 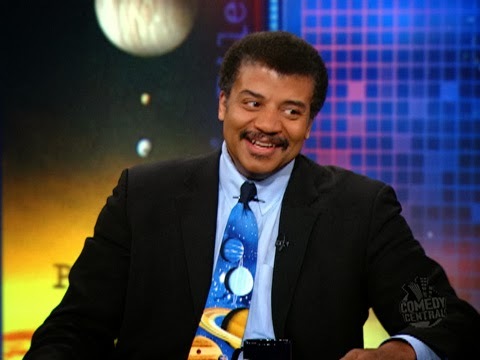 That's why they invented Neil DeGrasse Tyson-- astrophysicist, internet sensation, and space tie/vest connoisseur. I've loved this guy since Nova Science Now or maybe since he killed Pluto and wrote a book about it. And when I heard he would be the presenter for the revival of Cosmos, I knew he'd be perfect. I didn't realize how right I was or how much I needed this show until it started. This version of cosmos is faster and flashier than its predecessor but it doesn't shy away from hard science and fast-paced facts that aren't dumbed down. It has an urgency, too. It's clear that Sagan's push for exciting science education for the masses was an entire generation ago and a new ambassador needs to bring an update, an excitement, an urgent message to popular TV-- be curious, ask questions, don't be afraid of the answers. Neil DeGrasse Tyson is the perfect guy for this. And, in the end, he tells an amazing, personal story that explains, in part, why he's the perfect guy. So, go watch it. It was exactly what I needed. At the end of the episode I felt refreshed, revived, optimistic, and excited. Maybe it'll do the same for you. I tried, but couldn't stay w/it. Brannon Braga is a producer on this show, too, for what it's worth. Also Seth MacFarlane.